Vrijburcht is a multipurpose live-and-work complex for all age groups that offers many shared and social amenities for both the residents and the people from the neighbourhood. The complex was realised through a process known as ‘collective private commissioning’. In a social and cultural sense, Vrijburcht provides a positive impetus to the residential quality of the entire neighbourhood. The construction of Vrijburcht comprised 52 dwellings with an average size of 100 m2. In addition to dwellings, Vrijburcht includes three commercial units, two guest rooms, a care home for six youths with slight mental impairments, a shared hobby space, a cycle shed and a parking garage. The complex also includes a number of amenities that are of significance for the entire neighbourhood. These are a day care centre, a café with a terrace beside the water, a theatre, a floating platform for swimming, and a landing pier for a sailing club. The heart of the complex is the courtyard garden with large trees, mini-vegetable garden, fruit trees, grass fields, flower beds, picnic benches and a greenhouse, which is also the setting for communal dinner parties and festivities. All houses are reached via the courtyard where residents meet each other every day. Rain water is stored in underground tanks for irrigation. 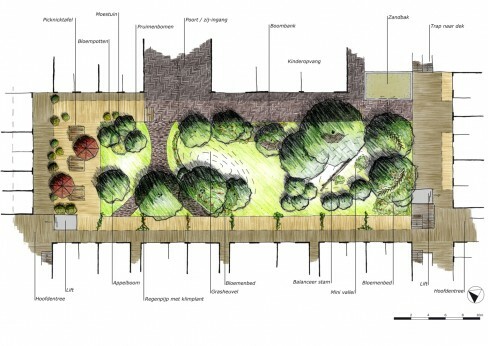 The design of the courtyard garden was made in close cooperation with the (future) residents. Via presentations, excursions, an opinion poll and several workshops a common idea about program, atmosphere and design style was formed: a lush green, natural and informal meeting space for all residents, young and old.